Virginia Gov. Terry McAuliffe joined WTOP live, in studio Aug. 27. WASHINGTON - Virginia Gov. Terry McAuliffe says state law should limit the dollar value of gifts to the first family and administration, not just require their disclosure on financial statements. 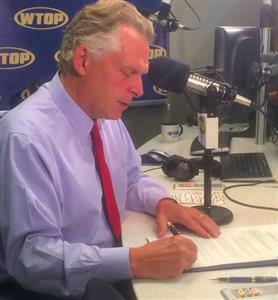 McAuliffe spoke about the need for ethics reforms Wednesday on WTOP's Ask the Governor program. The ongoing corruption trial of former Gov. Bob McDonnell and his wife Maureen should serve as the impetus for lawmakers to put teeth into state ethics laws, McAuliffe says. "I've got to assume there's an appetite now, after what we've gone through that there'll be a real movement to pass real reform," he said. And he hopes lawmakers will get close to the $100 gift limit McAuliffe imposed on himself, his own family, his administration and their families through an executive order. He says the tough restrictions drew a clear line for his cabinet members and those any would-be gift givers. "You can't give me any gifts, you can't give anyone who works for me any gifts. That's the right way. ... I think it sends a strong message," he says. He says he can accept gifts of little value like a T-shirt or baseball cap but not much else. In comparison, McDonnell and his wife are accused of accepting thousands of dollars in lavish gifts that included luxury clothes, golf outings and resort trips plus cash loans from a Virginia businessman seeking to curry favor with McDonnell. The McDonnell deny any criminal wrongdoing. In Virginia in the past, if you anyone gave the governor $1 million, all he had to do was to disclose it. "We've got to get away from that," McAuliffe says. Virginia currently has no limits to how much money can be given to elected officials as long as it's listed on annual financial disclosure forms. And reforms passed into law this year, did not go far enough, McAuliffe says. He says the trial, which is bad for Virginia's reputation as one of the best states for businesses, raises important issues. "We need a government, and especially with these new challenges that we face with the Virginia economy, we need to be open and transparent," he says. The governor wants to steer Virginia's economy away from its reliance on federal spending on the military and defense contractors. Virginia's slow job growth stems from sequestration, the mandatory budget cuts imposed by Congress, according to McAuliffe. But first he has to deal with a budget shortfall. Lower than expected revenues will require $346 million in cuts from the current year's budget plus another $536 million for next year. Lawmakers will consider how to make those cuts during the regular session, which begins in January. But agencies have already been instructed to find ways to cut and to possibly consider raising fees assessed to out-of-state visitors or businesses. No tax increases will be needed to address the shortfall, McAuliffe says. Meanwhile, lawmakers will return to Richmond in September to consider changes to the state's Medicaid program. McAuliffe is hopeful they will agree to expand Medicaid and accept federal dollars that would help cover the cost of expansion. However, legislators rejected that plan when passing the budget this summer after a months-long stalemate. McAuliffe, who chaired Hillary Clinton's presidential campaign, also discussed the former secretary of state's political future and whether she'll run for president a second time. "She has not made up her mind," he says. "She wants to get through this November election." In the meantime, Clinton has wrapped up her book tour and is enjoying her summer. McAuliffe wants her to run but says he also wouldn't be surprised if she decided not to enter the race. He also sidestepped a question on whether he would want to be her running mate, saying that being the governor of Virginia was the "greatest job in the world." "We'll know pretty soon. Let her enjoy what's she's doing now, she's entitled to it." The governor was willing to make a few sports predictions, saying the Redskins would make it to the Super Bowl and the Washington Nationals would face the Baltimore Orioles in the World Series.